We’d love your help. Let us know what’s wrong with this preview of Dark Zone by George Galdorisi. To ask other readers questions about Dark Zone, please sign up. After 2 weeks of trying to force my self to read this book and being bored to tears... I gave up on it. In my opinion, the poorest written one in the series. 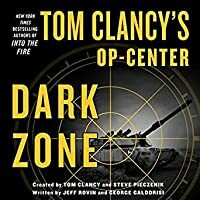 I somehow missed the first three Op Center series instalments, but I can assure you the fourth, 'Dark Zone,' is a fix for action adventure thriller junkies. This book reads like a flash, as the action is fast and the pace is furious. Two and a half day read for me, but it's not Tom Clancy epic long either. And what a timely, relevant storyline--Russian encroachment on Ukraine. This book's most 'rah rah' aspect might be the David vs Goliath story of Ukrainian Army tank commander Captain Taras Klimovich using superior intellect, tactics and terrain knowledge to humiliate the Russians when they came across the border to attack in 2014. Well, as things are heating up again in 2017, Klimovich comes out of hiding to torment the Russians once again. I wasn't aware that that the Dnieper River basically demarcated political leanings, but in general the parts of Ukraine west of the Dnieper are West leaning, loyal to Kiev. Those to the east, tend to be pro-Russian, hence they are conquest targets for Vlad Putin. Of course this eastern part includes the Crimean Peninsula with its long shoreline fronting the Black Sea. Known as the Soviet's only warm water port, Sevastopol is the prize that Putin so desires if the Russian Federation is ever to regain their Cold War status as the evil empire. Only problem is that the new boss is the same as the old boss. Russian can't generate a positive trade balance in spite of itself, so Putin can't afford to rebuild the superpower. He can, however, aggravate the fire out of the former Soviet republics, NATO and the US with his brinksmanship. I really, really badly want to like this series, because I loved the first Op-Center series so much. I chalked my issues with the first one up to a new writing team and getting used to new characters getting. The second one was frustrating. The third one lost one of the authors and got marginally better. And this one picked up the author of the original Op-Center books (Jeff Rovin) as a co-author. The dialogue is better, the pacing and structure are better, but it’s still not there. The first rou I really, really badly want to like this series, because I loved the first Op-Center series so much. I chalked my issues with the first one up to a new writing team and getting used to new characters getting. The second one was frustrating. The third one lost one of the authors and got marginally better. And this one picked up the author of the original Op-Center books (Jeff Rovin) as a co-author. The dialogue is better, the pacing and structure are better, but it’s still not there. 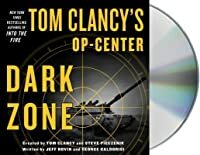 The first round of Op-Center books were ambitious and, in the Tom Clancy model, realistic enough to be in the realm of the 1-percent possible while far-fetched enough to be exciting. The team faced Neo-Nazis in Europe. The possible break-up of Spain. An attack on the United Nations. The new series feels more like policy seminars. Yes, there’s some action, and yes, there’s still some stretching of the likely. But they are so far on this side of plausible, and so steeped in the prevention dialogue of actual bureaucrats, that the fun quotient is way down. It sometimes feels like a Tom Clancy book written by the Brookings Institution. 2/5. They talk about mission creep in military operations. Unfortunately, what started as a solid Clancyesque spinoff series is suffering from mediocrity creep. Please don't do that to the memory of one of my favorite authors. This could have been a good book, timely, headline-fresh Ukraine vs. Russia espionage, top-shelf tech toys, all that good stuff. I read these stories to train my logic brain. Unfortunately, this one didn't do it. I picked up this book wanting to give another genre a try. I was hoping it was was like the Jason Bourne series. It wasn't. Despite being advertised as a "race-to-the-finish thriller", it was not. Perhaps it was because there were too many characters involved and I couldn't invest in any of them and that may be the genre. Whatever, it was a bit of a slog to finish it. I expected more from an OpCenter book. More action, more suspense. I didn't get it from this book. There was almost zero action in it at all, and it was mostly about the inner dialog of people sending others into possible action. Frankly, although the premise was interesting, the book was boring. 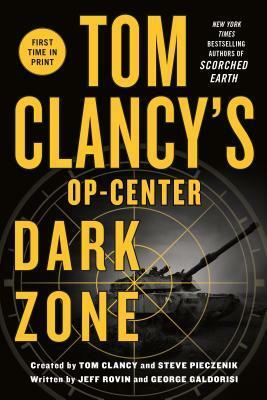 This book does more for the Tom Clancy brand than the mainstream Jack Ryan books. It brings back the old geopolitical themes and updates them for today's climate. It is easy to believe that what the authors put in here can actually be happening out there, right now. It does suffer from some pacing issues - the ending in particular is rushed. This genre is not my usual cup of tea, but I was willing to try it again because of the Tom Clancy name. It is rare that I put a book down before finishing it. Having said that, I couldn't get past Chapter Five. I closed the book and put it into the "return to library" pile. Too much impenetrable international intrigue. Had a hard time finishing this book. Expected more action. I guess Tom Clancy's name is beginning to have less relevance with the passage of time. My advice is to save your money and look for another book to read. Ok character development. Convoluted plot, plausible, difficult to follow. Most likely an informed look inside Putin's motives. Missing the grand sweep of Clancy. This not my favourite Op-Center book. Started with some very sloppy writing, which improved as the book went along. However, the worst part about the story is the characters were mostly boring and there was very little action. At the end, I was left wondering what the point of this book was. This one just didn't grab me like the others I've listened to. Dry and boring. Lots of old white men sitting in secret, sealed rooms discussing strategy and deploying troops or whatever. This book FEELS like it was written by committee. This story was tedious with no Op Center flavor. The author forgot that the opportunity center was a elite special unit that did not do things the normal way. If this is the format count me gone. Good action thriller in Tom Clancy style. Somewhat predictable but fast paced action as most Op Center books. Believable scenarios and scary enough to be real. This review has been hidden because it contains spoilers. To view it, click here. boring. 1st op center book that bored me. I like this type of story, relevant and linked to the Clancy franchise. The master's touch still there, God rest his soul. The master's touch still alive here, God rest his soul. These guys kept up the tradition grandly. Great read! Very timely, considering current events in Crimea, Ukraine and Russian budget constraints. Not the best in Tom Clancy’s Op-Center series. Some of the shifts were a little hard for me to follow, but the subject matter was fascinating so it kept me entranced. I've read every one of Clancy's Jack Ryan books, so I feel I can speak with a small bit of authority when I say that this was a disappointment. The story itself was good, but the writing left something to be desired. Definitely.not up to the standard one has come to expect from a novel published under Clancy's imprimatur. I'll give one small example: at one point a character refers to a "twelve inch 40 caliber" weapon. Well, is it a foot-long .40 cal. pistol? Or what? .40 caliber is 0.4" diameter I've read every one of Clancy's Jack Ryan books, so I feel I can speak with a small bit of authority when I say that this was a disappointment. The story itself was good, but the writing left something to be desired. Definitely.not up to the standard one has come to expect from a novel published under Clancy's imprimatur.